"This is another great gift idea. Layered soup in a jar. What a fun, easy way to make someone's day!" In a wide mouth 1 quart jar, layer the barley, peas, rice and lentils. Then layer around the edges the onion, parsley, salt, lemon pepper, bouillon and the alphabet pasta. 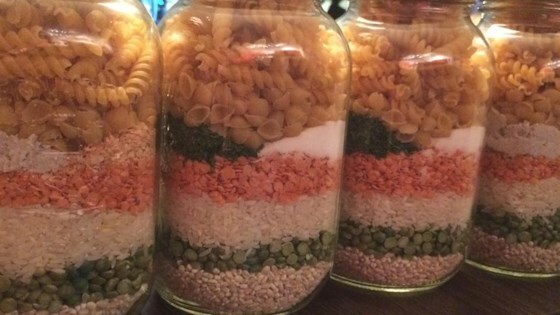 Fill the rest of the jar with the twist macaroni. Seal and attach a gift card. The gift card should read: Add contents of jar to 3 quarts of water, 2 stalks of chopped celery, 2 sliced carrots, 1 cup of shredded cabbage (optional) and 2 cups diced tomatoes. Over medium low heat, cover and simmer about 1 hour, or until vegetables are tender. The soup is very good and makes a great gift. For single persons or small eaters, cut the recipe in half and put into a pint jar.